Basically, rather than using the beers in their original form, she heats them with other ingredients, reducing them down to syrups that she then mixes with spirits and other mixes to create new cocktails inspired by old classics. 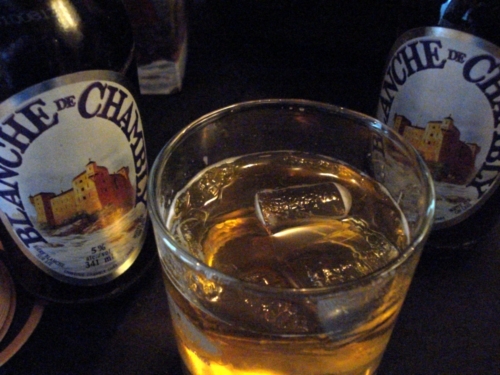 For example, the Chambly 75 (pictured above) is a riff on the French 75, made with a reduction of Blanche de Chambly and lemon that’s mixed with gin and lager (the latter taking the place of Champagne from the original). Even better is Damned & Stormy, a variation on the simple but tasty Caribbean cocktail Dark & Stormy that’s made with ginger beer and dark rum. For her version, Tham reduces Maudite with a bunch of ginger, lemon juice and demerara sugar, and then mixes the syrup with club soda to create a homemade ginger beer which is combined with Appleton Estate rum. The result is a perfect summer drink, especially paired with the slider-style jerk chicken sandwiches topped with pineapple, mango and arugula that the kitchen offered as an accompaniment. As impressive as these drinks were (or are, rather, as they’re both still available to purchase at beerbistro), Tham’s other recent project is even more unique and ground-breaking. Inspired by the barrel-aged cocktail trend that is all the rage with cutting edge bartenders, she has created what might well be the world’s first barrel-aged beer cocktail. The process started with a 5 litre oak cask being primed for a few weeks with some Sam Adams Winter Lager, which was discarded before the experiment began in earnest. 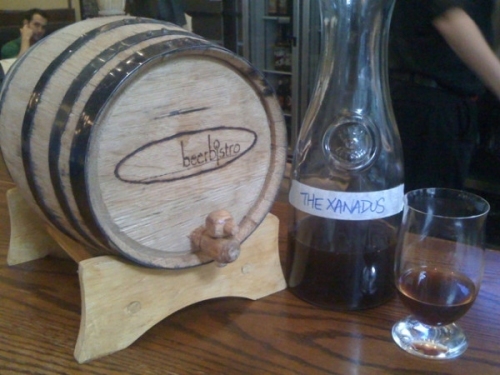 The base of the cocktail was one of beerbistro’s last remaining bottles of Sam Adams Utopias, which was blended together with a seemingly odd assortment of other tipples including Carpano Antica vermouth, Amaro Montenegro herbal liqueur, XO Beer with Cognac, Prince Edward County Ice Cider, and Maker’s Mark bourbon. Tham intended to age the resulting liquid for 2 weeks or so, but her daily tastes via eye dropper told her that it needed more time, so it was just over a month before it was transferred from wood to bottle and given a finishing touch of Bitterman’s Boston Bittahs, small batch bitters made with citrus & chamomile. And as a nod to its main ingredient, the final product was dubbed The Xanadus. With a weighty name like that, you’ve gotta have something pretty serious to back it up, and this hazy ruby beauty does its label proud. The aroma comes across like a slightly oxidized port or sherry, with additional notes of stewed raisins and cherries, oaked bourbon, and bright hints of citrus. All of these are noted in the flavour as well, along with herbal undertones, a suggestion of wood, a vein of slightly tart acidity, and even a hint of root beer. While some of these elements show evidence of the cocktail’s component ingredients, the whole thing is so smooth and tasty and well-integrated that it’s easy to forget how it started and just enjoy what it has become. For a first attemp, Xanadus is a smashing success. And while there are no full bottles of Utopias left for her to play with, Tham intends to keep the barrel in action. So once the last few shots of Xanadus are gone, there will hopefully be another boundary breaking libation waiting in the wings to take over its spot on the beerbistro bar. This entry was posted in bars & pubs, beer reviews, cocktails and tagged beer cocktails, beerbistro, Michelle Tham, Samuel Adams, Unibroue, Utopias. Bookmark the permalink. I love beer … never had a beer cocktail.